Following her debut EP, Melbourne alt vocalist, Symmetrix returns with her debut album, Being There, an introspective compilation of tales exploring lost love, truth and self-understanding. Symmetrix presents a smooth hybrid of alternative electronica and indie rock utilising a mixture of electro synth beats and guitar driven, indie pop melodies to captivate the listener.Her soft vocals drift effortlessly over the compilation, creating vivid scenes, invoking emotion. The lead single, Day at a Time is about trying to live a healthy positive life both mentally and physically, despite the temptations and at times frustrations of everyday life and the dichotomy that surrounds that. 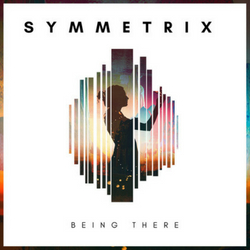 To aid the release of Being There, Symmetrix will be releasing a live music video for What They Say. What They Say was written about different experiences in a work setting over the years. Most people, particularly ‘creative types’ can relate to feeling like the ‘square peg in the round hole’ when it comes to the working world. Being There is set to be released on the 27th of September on all Platforms.